Godalming in Bloom 2018 was sponsored by Cornmeter, J Gorringe & Son Funeral Directors, Godalming Town Council, Seymours Estate Agents, Shorts, Squires Garden Centre in Milford and Waitrose in Godalming. We are so grateful to our sponsors for funding the 2018 competition and would like express our sincere thanks for their sponsorship and support. Godalming in Bloom is a fun and friendly gardening competition, open to anyone and everyone who gardens in Binscombe, Busbridge, Farncombe and Godalming. Godalming in Bloom is run by horticulturalists working as volunteers who hope to encourage everyone to garden and take care of the beautiful area in which we are so lucky to live in. We visit schools, allotments, residential homes, restaurants, pubs, offices, anywhere and everywhere we can encourage people to garden. We'd like to encourage you to grow plants that are beneficial for bees and other insects, and to look after our wildlife and we invite you to enter our fun and friendly competition. Following an intensive programme of judging in June, the annual prize-giving took place at the Wilfrid Noyce Centre on Tuesday 10th July in front of a record audience. Godalming in Bloom celebrates the horticultural best of local Allotments, Commercial properties, Gardens and Schools. This year, we also announced the winner of the design competition of a Memorial Garden to be created at Nightingale Road Cemetery, which will be officially opened on 10th November as part of the Armistice Centenary celebrations. Our thanks to our sponsors this year, without them we would struggle to achieve our programme and with it, the professionalism that is expected from us – our thanks to Cornmeter, Gorringes, Godalming Town Council, Seymours, Shorts, Squires and Waitrose. Presentation of ‘Highly Commended’ certificates were presented to - Farncombe Infant School – Broadwater School – St Edmunds School – St Hilary’s School. All the Schools also received Gardening Vouchers from Squires. Sarah Collins was presented with the Chairman’s Award. Past Mayor of Godalming David Hunter announced the winner of the design competition was Michele Clackson. Our thanks also to Pizza Express who provided us with pizzas at the prize-giving - to Maggie Swaden – Chairman, Milford Horticultural Society – who gave an inspirational talk and to the Mayor of Godalming who attended all the judging visits this year. Beth Otway is also sorely missed - however she is still very busy and writes for Vantage Point Magazine – read her monthly column and go to www.pumpkinbeth.com for more gardening tips & advice. 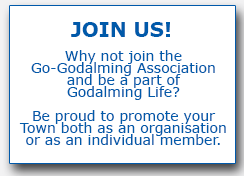 If you are interested in becoming involved, let chairman Simon Crowther - simoncrowther7@gmail.com or secretary Anne Eve at secretaryGIB@gogodalming.org.uk know.